This fine antique George III sterling silver pint mug has a plain baluster shaped form onto a circular domed spreading foot. The surface of this antique silver mug is plain and unembellished. The foot and flared upper rim of the body are encircled with bands of tooled decoration. 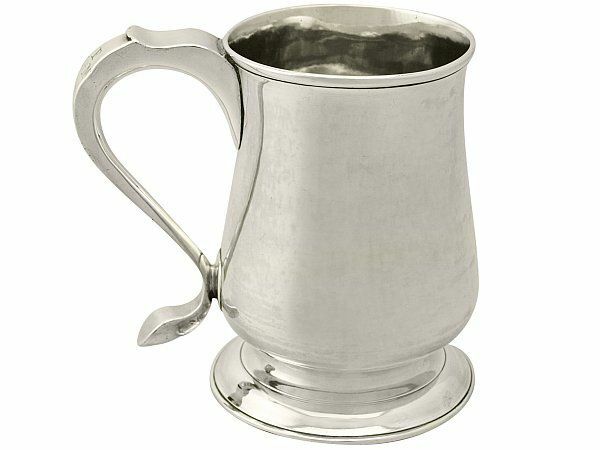 The Langlands silver mug is fitted with an impressive S scroll handle incorporating a plain thumbpiece; the handle is struck with the maker's mark as to be expected. The handle is ornamented to the upper portion with the contemporary engraved initials '˜FIM' surrounding a central star motif. 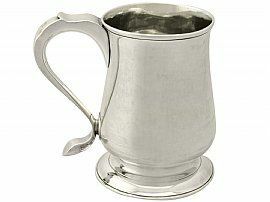 This pint mug was crafted by the renowned Newcastle silversmiths John Langlands I & John Robertson I. Read about the history of mugs and tankards here. This antique silver mug is a very good gauge of silver, fine quality and in excellent condition. There is a minor ding to the handle by the engraved 'M' and some natural fire marks to the surface of the mug; these do not detract from the aesthetic appearance of this antique item. Full hallmarks struck to the underside of the mug and marker's mark to the handle are all very clear; the second portion of the hallmark to the handle is worn but remains legible. Reflections in photography may detract from the true representation of this piece of Georgian silverware. Height to top of handle 12.9cm/5.1"
Length from back of handle to front rim 13.4cm/5.3"